Saw-scaled viper: Credit & copyright: Wolfgang Wüster Every year, snakebites kill up to 90,000 people, mostly in impoverished, rural tropical areas. 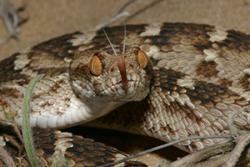 This statistic is surprising when one considers that antivenoms are available, however, the truth is that the efficacy of antivenom is largely restricted to the snake species that was used in manufacture, and they are often ineffective in treating snakebite by different, even closely related species. Writing in PNAS (Proceedings of the National Academy of Sciences of the United states of America doi.10.1073/pnas. 1405484111) Dr Nicholas Casewell and Wolfgang Wüster of Bangor University and colleagues identify the mechanisms by which the variations in venom occurs between related snake species and also the significant variations in venom toxicity that occurs as a result. The findings underscore challenges to developing broad-spectrum snakebite treatments. “Variation in the toxic composition of snake venoms between species can have major medical implications for the treatment of human snakebite victims. The paper’s authors suggest that gene and protein expression influences venom content across species. Changes in the composition of venom toxins between snake species also caused differences in venom function, by affecting the ability of different venoms to cause haemorrhage and coagulation. 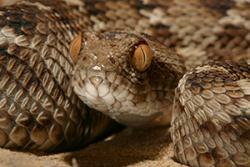 More importantly, antivenom produced by immunising sheep with the venom of one species of saw-scaled viper was ineffective at neutralising the venoms of the Saharan horned viper, puff adder, and another species of saw-scaled viper, highlighting how changes in venom composition can adversely affect snakebite therapy.